Labels Xpress strives to stay up to date with recent technologies in the graphics field to give our clients a wider range of freedom and versatility. Our design group is capable of handling most vector based artwork done in both Mac and PC Platforms and are always ready to assist you with your graphic needs. 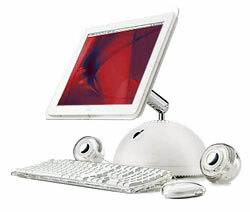 A Dual Macintosh and PC Working Environment. Make sure all fonts are converted to paths, curves or outlines before submitting your artwork. All colors are to be clearly marked to identify items to be printed with PMS color numbers. Whenever possible, black-and-white or color proofs should be submitted with the artwork in order to evaluate the translation of any converted files. When supplying artwork electronically a pdf of your artwork is preferred if possible. All colors are to be clearly marked to identify items to be printed with PMS color number or name. Labels Xpress has the capacity to read files presented on 3.5" floppy disks, ZIP disks, CD-ROM's and DVD. We cannot accept files on Syquest, optical disks, or DAT tapes. Files can be sent to us electronically via E-mail up to a maximum file size of 10MB. Any files that are compressed must be saved as Self-Extracting Archives when possible. Labels Xpress does have the capacity to decompress most of the industry standard compression formats. All pre-press preparations to supplied artwork will be done by Labels Xpress creative department. If you have any further questions about submitting your artwork to Labels Xpress feel free to contact us at (800) 367-7336.